There’s a new kid on the block. It’s the Air Fryer and it’s about to take over the world. These days we’re all about making good meals that our families will love that don’t take a ton of time, right? That’s why I have a ton of slow cooker meal posts, freezer meals, and how the Instant Pot came to be so popular over the last couple of years. Well today I’m going to introduce you to something that more and more people are talking about – the air fryer. An air fryer is a kitchen appliance/gadgety thing. It is NOT an actual fryer because that would mean whatever you’re frying is cooking in oil and fat. This machine is meant to give you the taste/texture of fried food without the fat. It’s a convection oven that sits on your countertop and you add food into the mesh basket of it. And you can typically make things quickly. Win/win! 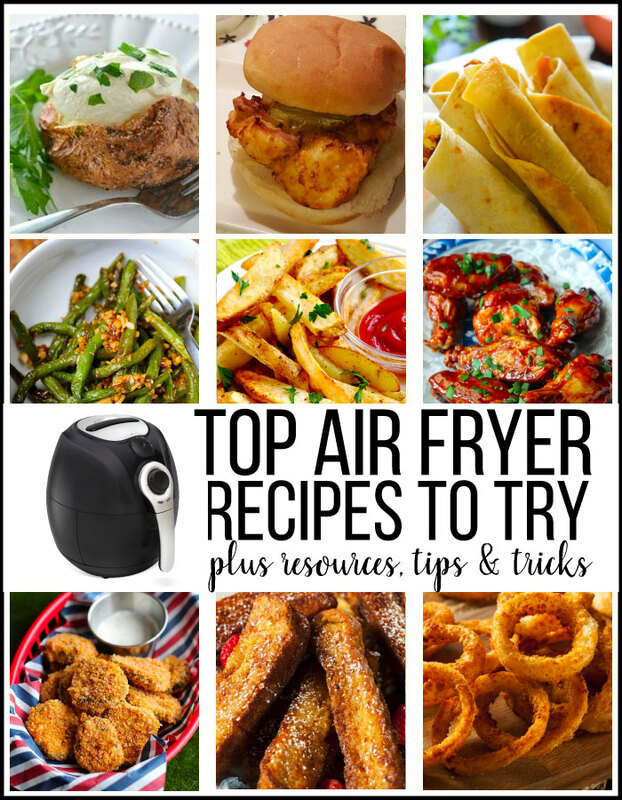 Where do I get an Air Fryer? You can get one pretty much anywhere you would buy any kitchen appliance – Target, Walmart, Best Buy, etc. I bought mine on Amazon last summer when it was a daily deal. I had heard about them over and over and knew I should get one while it was on sale. Plus I didn’t have to leave my house and it was delivered to me in 2 days. The one that I got is currently unavailable but you can find tons of with good reviews here or here. If you’d like to get accessories you can get all kinds of things! Get a Cheat Sheet here! These are awesome posts that will help you get started on this journey with your new AF! Air fryers are the best. I have too. If you do not like the smell, oily taste, or the oil clean up of a traditional fryer, this is for you. I really need a cookbook.. where can I get one? We got one for Christmas and like it,food taste good and easy to use.